We sell and service irrigation systems for commercial and residential use. Evergreen has installed over 5,000 systems in Kentucky. Our company takes pride in providing property owners with high-quality irrigation systems, outdoor lighting, and service. In 2008, we were featured in the Louisville, Kentucky, Extreme Makeover Home Edition with Ty Pennington. Our company was honored to be part of such a worthy cause. For additional information and a FREE quote call: (502) 243-7007. 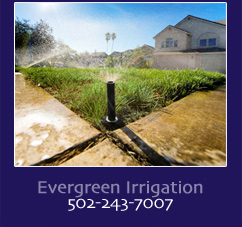 Evergreen Irrigation serves in and around Louisville, La Grange, Prospect, Middletown, Jeffersontown, Brownsboro, Crestwood, St. Matthews, and Southern Indiana.